Hill Country Retreat is an active adult community by Del Webb and Village Builders located in Texas Hill Country in historic San Antonio. This 55 and over community boasts a large clubhouse filled with top-caliber amenities. It will be home to over 2,000 luxuriously appointed single-family homes. 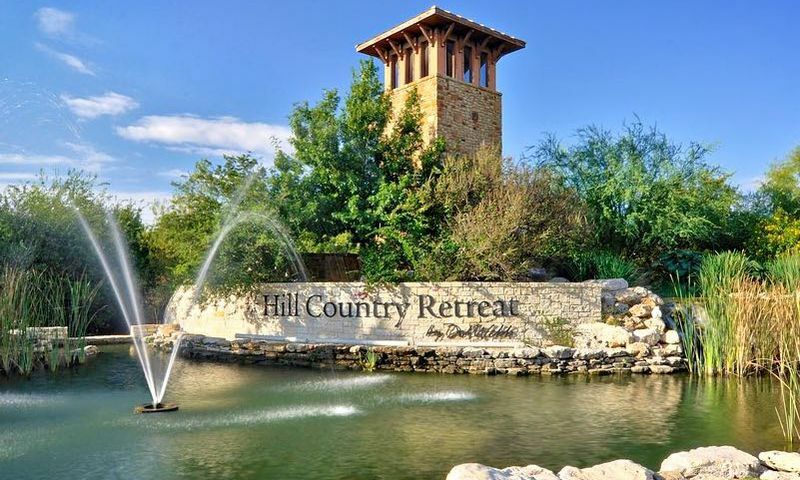 Hill Country Retreat provides residents with a tranquil setting. This beautiful area of San Antonio boasts amazing views of wildlife meandering through the lush and natural landscaping of the hills. From the moment you drive past the cascading waterfalls and mature oak trees at the entrance you will feel like you are entering your own private resort. The 28,000 square-foot clubhouse, aptly named "The Resort", is the jewel of this community. For residents who want to stay in shape, The Resort offers a large state-of-the-art fitness center, with an aerobics studio, and an indoor pool that offers water aerobics, lap lanes, and free swim. The indoor pool is surrounded by an indoor walking track located on the second level. There are also multi-purpose rooms for joining a community get together. For social activities, The Resort features a flexible ballroom, which is used for a wide range of events. With multiple hobby and game rooms there is definitely no shortage for artists and craftsmen to enhance their skills. But there is still more inside, a billiards room and a library are also part of the clubhouse. For outdoor recreation and activities, residents have good choices within this 55+ community. Two tennis courts and bocce ball courts invite friendly competition among the residents. Walking and biking trails throughout the community allow for peaceful reflection, and some of them even lead to several lakes in the area. Not only will fishing and boating enthusiasts enjoy living in this active adult community, but nature lovers of all kinds are sure to enjoy the Government Canyon State Park and OP Schanbel Park, which are close by. Del Webb began construction of Hill Country Retreat in 2006. Upon completion, it is expected to contain over 2,000 single-family homes. In 2013, Village Builders bought 100 lots within Hill Country Retreat. There is a home style, size and price range to match the needs and budget of almost any active adult buyer. All houses built by Del Webb in this community are single-family one-story homes and some feature an optional second floor. These homes come in three different styles and are available on a new and resale basis. Sizes range from 1,109 square feet to 2,691 square feet, and all homes have the same low monthly fees. Del Webb offers several different floor plans, upgrades, color selections, elevations, and amenities. Most homes have two to three bedrooms, one-and-a-half to three-and-a-half bathrooms and a den. All homes feature flowing floor plans suitable for entertaining, and have two to three-car garages attached. Village Builders offers six additional floor plans that range in size from 2,150 to 2,838 square feet and are now available on a resale-only basis. These homes have two or three bedrooms, plus a den, two to three-and-a-half bathrooms and attached two-car garage. Some great features of these energy-efficient homes include ten-foot ceilings, crown molding throughout, and gourmet kitchens. Most residences are single-story ranch homes besides the Savannah floor plan that features an optional second floor loft which can be used as a third bedroom. Residents enjoy a quality lifestyle with peace of mind. A full time activity director is on hand to offer an exciting array of activities and events. Some of the unique activities provided are walking clubs, potluck dinners, Wednesday night movies, Friday night socials, health and fitness presentations, cruises, ski trips, nature trips, and more. In addition, there is an impressive list of social clubs. Artists are represented in the paint group, while crafters can give it a go in the needle craft and scrapbooking groups. There are groups centered around activities such as cycling and bowling, groups for card game lovers, and fitness oriented groups. Hill Country Retreat in San Antonio is conveniently located near Loop 1604 and Highway 151 area. Grocery and retail outlets, golf courses, and a medical center are only minutes away. Even the airport is only half an hour away from the community. Just twenty miles to the east, residents are in the heart of San Antonio and all its attractions like the Riverwalk and the Alamo. Downtown San Antonio has many other popular attractions. Sports fans can enjoy watching the San Antonio Spurs, the Rampage of the American Hockey League, the Silver Stars women's basketball team of the WNBA, and the San Antonio Mission Minor League baseball team. San Antonio is also home to the Museum of Art and the McNay Art Museum. Visitors can enjoy Broadway shows, concerts, and the San Antonio Symphony at the Historic Majestic Theatre. Six Flags Fiesta Texas, Sea World, and the San Antonio Zoo would make great day trips for when the grandchildren come to visit. Some other popular attractions in the area include Alameda Theatre, Alamo, Aztec on the River, Pape's Nutcracker Museum, and IMAX Theatre. This 55+ community is surrounded by a delightful array of exciting golf courses. They include Hyatt Regency Hill Country, The Golf Club of Texas, La Cantera, Cedar Park Municipal Golf Course, and Oak Hills Country Club. Hill Country Retreat is an ideal active adult community that offers beautiful homes, great amenities and a convenient location. The Resort Clubhouse - 28,000 Sq. Ft. There are plenty of activities available in Hill Country Retreat. Here is a sample of some of the clubs, activities and classes offered here. Garden Series by Del Webb offers seven models that range from 1,109 to 1,465 square feet. Homes feature two to three bedrooms, one-and-a-half or two bathrooms, and an attached two-car garage. Noir Coast, Steel Creek, and Taft Street are available as new construction. The Classic Series by Del Webb features seven models that offer between 1,696 to 1,982 square feet of living space. These homes feature two to three bedrooms, one-and-a-half or two bathrooms and two or three-car garage. Most have spacious family and dining rooms perfect for entertaining. The Abbeyville, Castle Rock, Kendall Rock, and Martin Ray models are available on a new construction basis. The Estate Series by Del Webb offers residents between 2,182 to 2,669 square feet of living space. Home feature two to three bedrooms, two to three-and-a-half bathrooms and a two to three-car garage. The covered patio offers additional entertaining space and is the perfect place to read the morning paper. The Magnolia, Napa Valley, Tangerly Oak, and Sonoma Cove are available on a new construction basis. Village Builders offers six floor plans that range in size from 2,150 to 2,838 square feet. These homes have two to three bedrooms, two to three-and-a-half bathrooms and an attached two-car garage. Some great features of these energy-efficient homes include ten-foot ceilings, crown molding throughout, and gourmet kitchens. These homes are available on a resale-only basis. Great place to live....friendly people, lots of activities,and reasonable HOA fees. My husband and I have lived there over four years and play lots of pickleball, belong to the Wine and Dance Clubs. All that while still working! HCR has been the answer to a prayer for my wife and I. Though I am retired and my wife is disabled, we are at a loss for time to do all of the activities presented to us. This is truly a community for ACTIVE adults. We have lived here for four months, just moving into our new Village Builders-Lannar home two weeks ago. In that time we have made more FRIENDS who share the same active attitude as we do. Our community is in the perfect location to explore TEXAS and America. Our trips are most often with friends but occasionally just the two of us. HCR is a great place to live with FRIENDLY ACTIVE neighbors! So far everything has been very good. People you meet are friendly, the grounds are neatly terraced, Pulte employees are very helpful. Making changes to the home and will probably be moved in by the end of April. It's located in Alamo Ranch so that it's more affordable for development. If it were downtown or on I-10, the lot prices would be over 150K. As for me, I don't want to live in Comfort or commute through the crowded I-10 corridor. This resort is so quiet that the loudest sound I heard today was an air conditioner, although it competed with chirping birds and cooing doves. I think this is the place for my husband and I--I just turned 55 last year, but the community is rather youthful, and like us, most of the residents are still working. It feels like home, and yet, it feels like a permanent vacation. Hope to make the move soon. This is a beautiful neighborhood. Had a tour by current residents. I do not like the location of this community. 1604 at Culebra is a mess of traffic and construction. Del Webb needs to build another 55 plus community somewhere else in San Antonio. I've lived here since 1983 and know the area extremely well. I'd love to see a community like it built near 1604 and I-10 and or downtown. This community is not in our Texas "Hill Country" and in 5 years it will no longer be a retreat with all the new construction going in around it. Dell Webb can do better! How about a community near Comfort (to keep prices low)? 55places.com is not affiliated with the developer(s) or homeowners association of Hill Country Retreat. The information you submit is distributed to a 55places.com Partner Agent, who is a licensed real estate agent. The information regarding Hill Country Retreat has not been verified or approved by the developer or homeowners association. Please verify all information prior to purchasing. 55places.com is not responsible for any errors regarding the information displayed on this website.